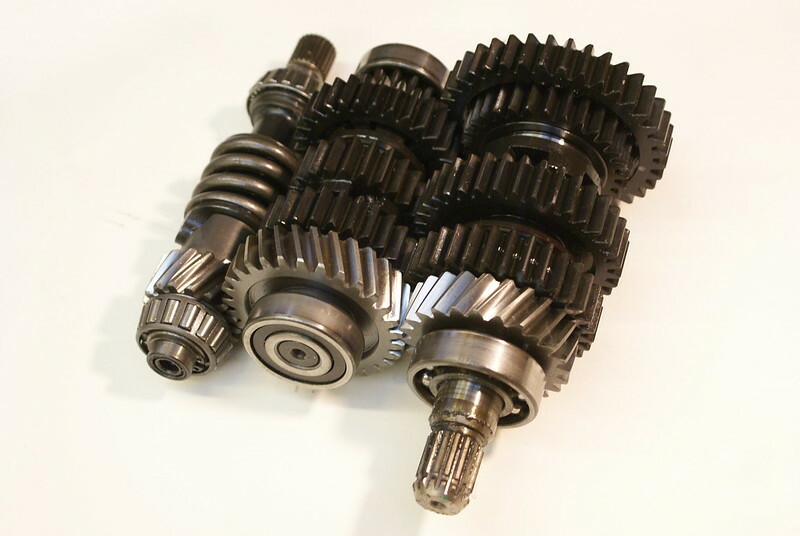 High Ratio gears and final drive. 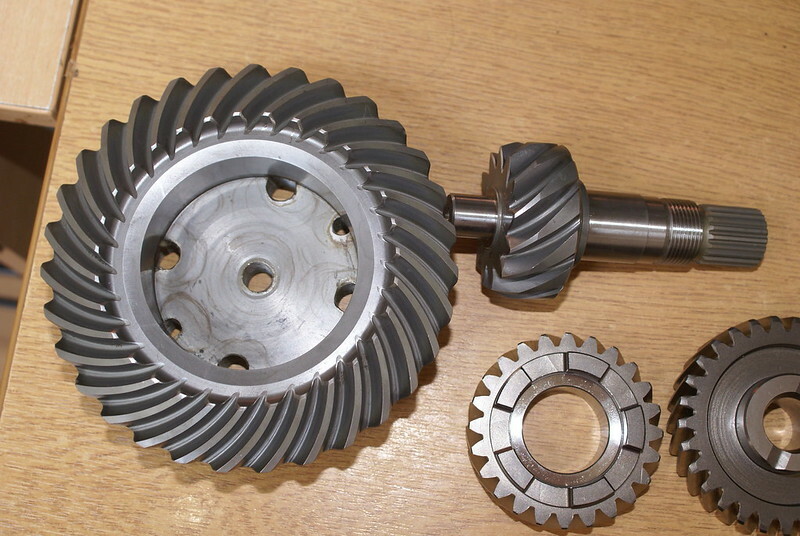 Changing gears and bevel box pinion removal. K100-forum.com » Technical, repair and troubleshooting » Engine and transmission » High Ratio gears and final drive. 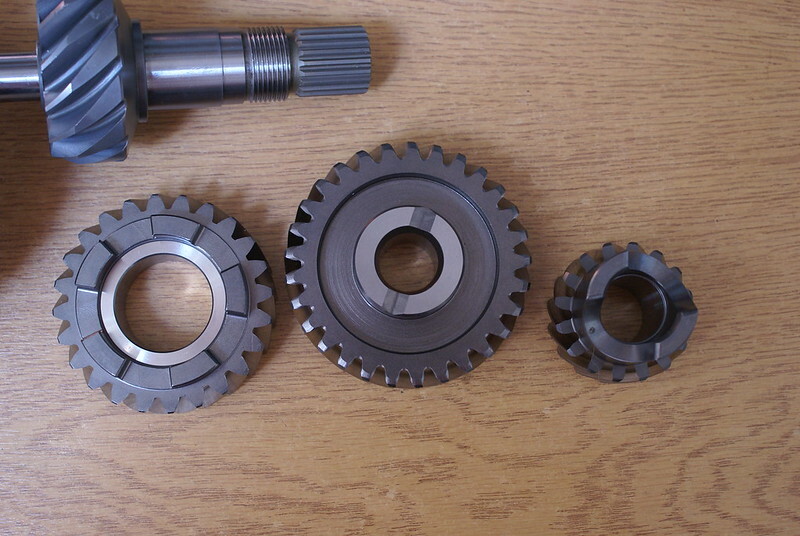 Changing gears and bevel box pinion removal. 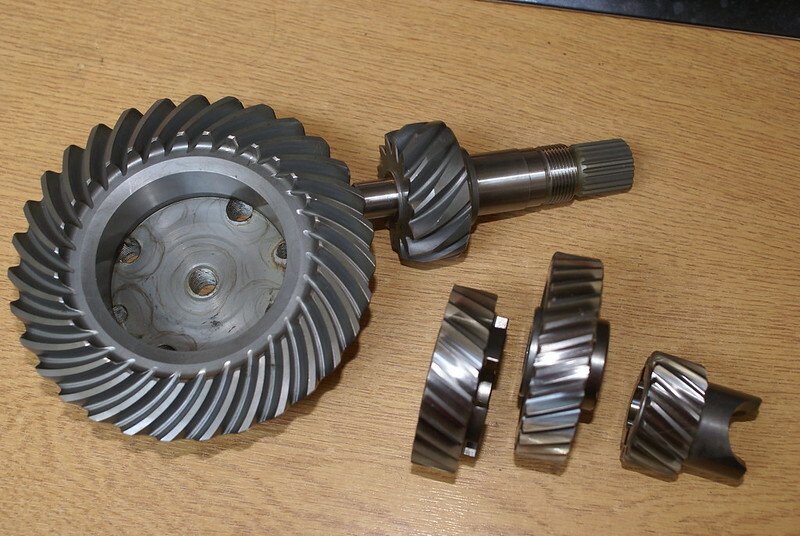 I am changing some of the gears in my gearbox because I need higher ratios for my Mercedes Smart Diesel engined K 100. 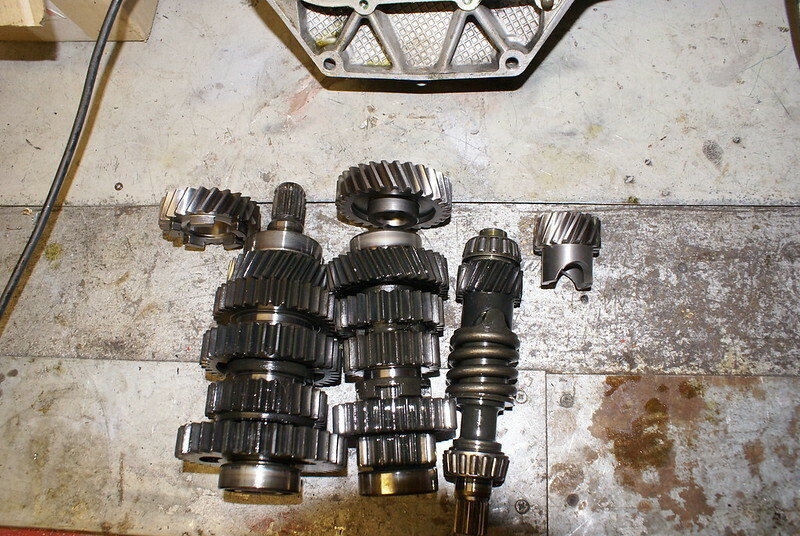 I’m also changing the final drive ratios and one of the guys in Germany as had a whole gear set cut. It basically doubles the overall ratio. Here is the cluster before changing the gears. You can see the new shiny years adjacent to what they are going to replace. Taking the final drive apart is not for the fainthearted. I’m sure that shimming it up, on rebuild, is going to be “interesting”. Mine is now in a zillion pieces and ready for reassembly. 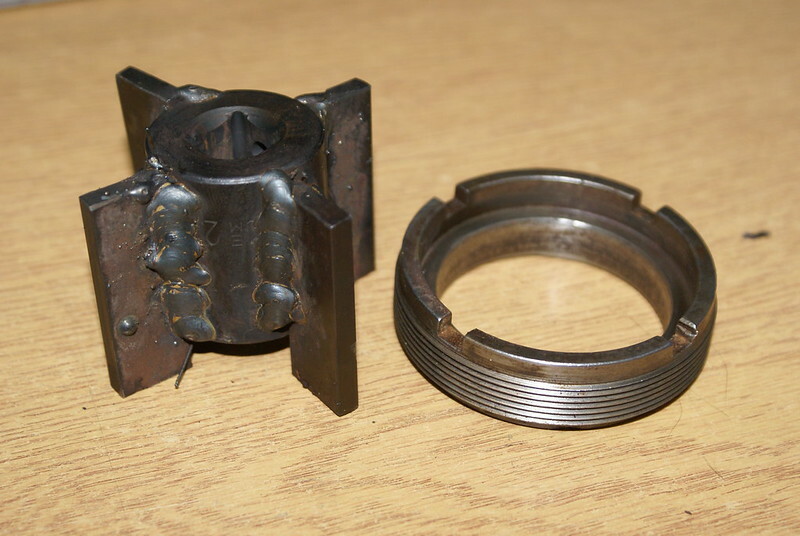 Don’t even attempt to strip the K 100 final drive unless you have a 36 mm impact socket, a long bar, and a tool to remove the 4 slotted ring nut which holds in the final drive pinion. I made the tool by welding 4 wings onto an old socket. They are both v tight. The manual says use heat. 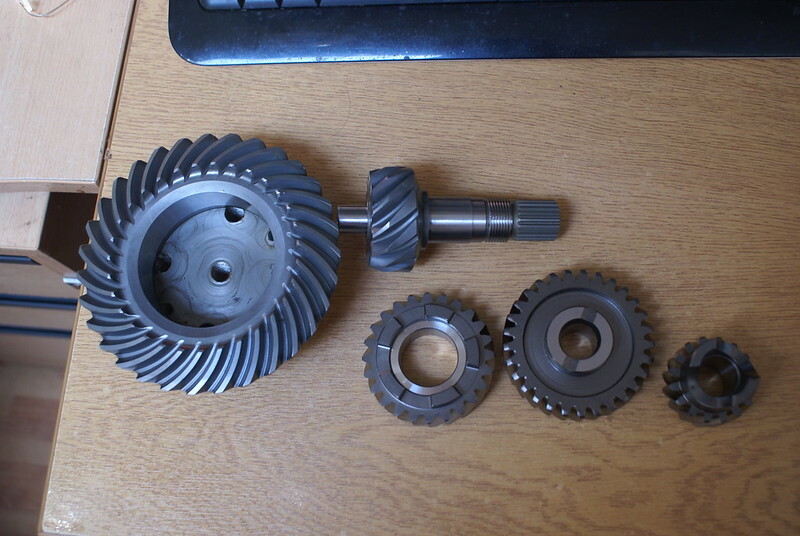 Because I’m replacing both the crown wheel and the pinion, all the parts which fit on the crown wheel and pinion have to be removed. The one job that took longer than anything else was removing the inner race of the nose of the pinion which fits into the needle roller bearing in the aluminium housing. There is nothing to get the bearing puller on. 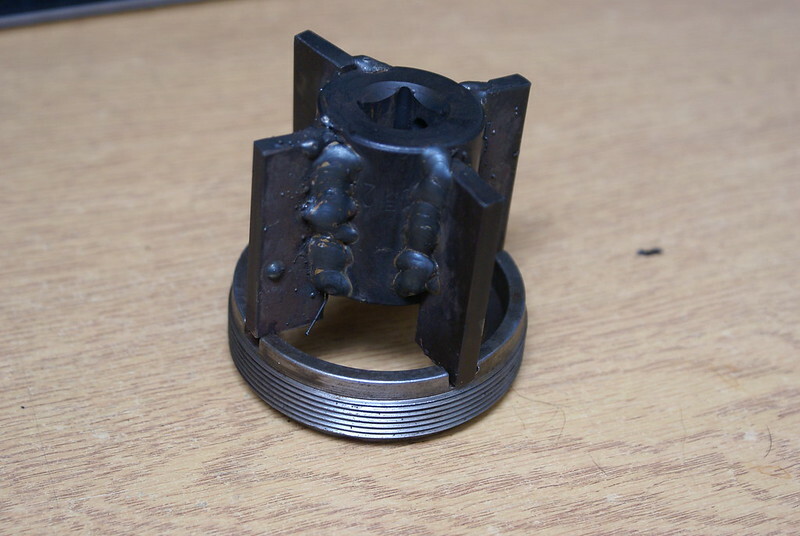 The large bearing came off with the help of a 10 ton press and the centre part of the crown wheel (the aluminium bit) succumbed to a few tonnes less. I’ve now got to think about putting it back together and doing all the correct shimming. Deep joy. I do have one problem and that is that the input splines on the pinion of the final drive has 20 splines and my shaft is 16 splines. I may need to find another shaft. I’m assuming that all the front of the driveshafts are 16 otherwise I might have to change gearboxes or make hybrid shaft. I just thought I’d share this little gem with you. Well, if shimming it up is as 'interesting' as shimming Guzzi drives, then put aside at least a half-day. Or a full one, if it decides to fight back. What ratio are you using in the final drive? I have the Clymer manual so I can see the process. I guess it’s a case of just doing it carefully and not rushing. RE: Ratios, I haven’t counted teeth but here they are. Assembled cluster with new gears in situ. Pretty isn’t it? Background is the back of a roll of wallpaper. 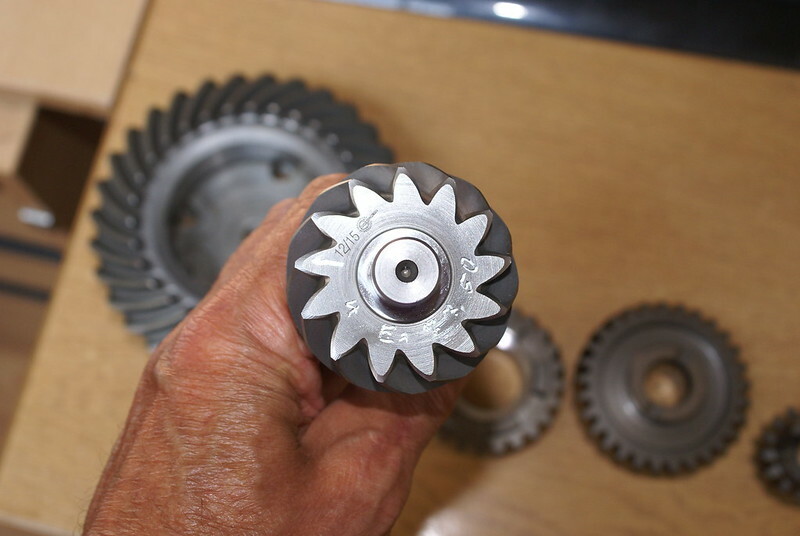 That Crown and pinion is 13/31 (2.38) did you get them made and if not where the heck did you get them. I've never heard of a BMW ratio that high. 2.52 was the best I could come up with when I went looking. I should have kept my gob firmly shut. I just spent six-and-a-half hours shimming a Guzzi bevel drive. I really hope you have better luck than I did.